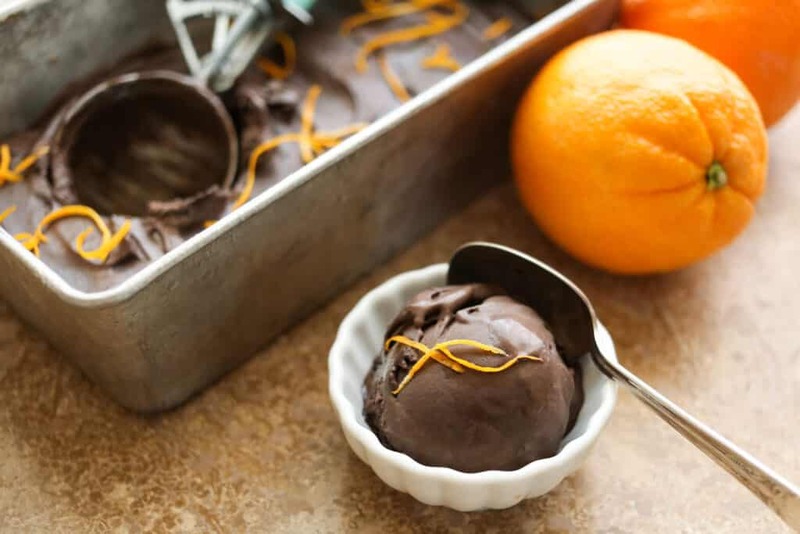 Rich, dark, ultra-smooth, and creamy chocolate meets a hint of orange in a sweet ice cream like no other you’ve ever tasted. 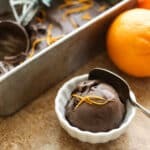 If you’re skeptical of the chocolate and citrus combination, one taste will be all it takes to convince you. What is it about being on vacation that allows us to indulge a little more? We forget about the calories, and dive into each meal, not caring about how many extra minutes it might cost on the treadmill or whether or not we really should be eating ice cream after both lunch and dinner. There’s something ultra-relaxing and peaceful in the vacation mindset. While we were vacationing this summer, we ate a lot of ice cream, a heck of a lot of ice cream. There is so much evidence of that in my Instagram photos, it’s kind of laughable. I wanted to remember each flavor and each wonderful place we visited; and as a result many pictures were taken. We tried a Chocolate Orange flavored ice cream while we were in Montreal and Sean declared it the best one he tried throughout our vacation. It really was fantastic. So, naturally, I couldn’t resist trying my hand at recreating it. Four (maybe it was five ?) batches later, this ice cream has been declared one of Sean’s all time favorites. 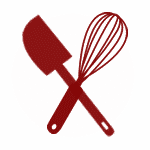 Whisk together the sugar, cream, milk, cocoa, cinnamon, salt, and orange zest in a medium size saucepan. Bring to a boil and then reduce to a simmer while stirring occasionally for 2 minutes. Add the chocolate chips and continue stirring while the chocolate melts. Remove from the heat and stir in the orange juice and vanilla extract. Let cool and then chill in the refrigerator for at least 4 hours. 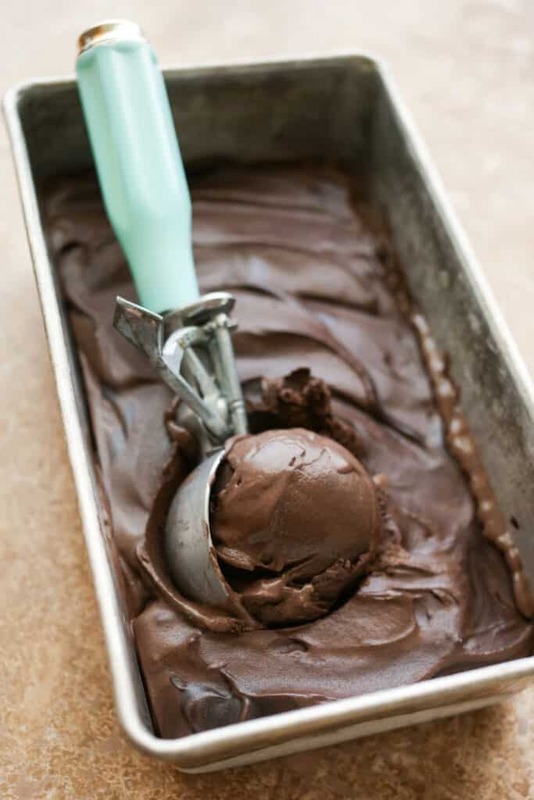 Pour the chilled mixture into your ice cream machine and process according to the manufacturer's directions. Enjoy! Special dark cocoa is my preference for this recipe. However, you can use a standard dutch cocoa or plain cocoa powder as well. (The color will not be as dark without the special dark cocoa.) I've made this both with and without orange zest, as well as with store-bought juice. The zest makes a big difference in the results. Fresh and store bought orange juices both work well. The fresh is a milder flavor with a little more sweetness to it. The store-bought orange juice was just enough stronger than fresh that I preferred it in the end. Hi, The pictures are amazing. I am thinking of giving it a try this weekend. Did you use whole milk in this recipe? Yes, I use whole milk. Thank you. I just made the ice cream with 2% milk. It was really dark and intense which is how i prefer my ice cream. I actually just saw your comment, so next time I am going to try it with whole milk and store bought orange juice. I have an ice cream maker where the bowl actually has to be frozen, so do you think the mixture would still need to be chilled? Yes, definitely. A warm ice cream base will cause your ice cream bowl to thaw quickly. This recipe is incredible! The texture of the ice cream is perfection; as good as anything ice cream parlour serves up. I used slightly less orange juice and more orange zest. I also used Lindt dark chocolate that has little crunchy bits of hazelnut. One of the best ice creams I've ever eaten.